School districts are increasingly looking at Apps to improve Parent engagement. Several school districts have already developed and launched custom school app for their district. But some school districts have learned the hard way that nearly 1 in 4 people abandon mobile apps after only one use. Districts considering custom school App need to know that Apps most likely to be opened fall into social media category that support in-app messaging and use push notifications effectively. Typical custom school App includes a district news feed, push notifications, calendar, directory and links to school resources & social media. So why are custom school apps not able to retain parents? The devil is in the (content) details – A news feed with district news snippets is not a message feed that will engage the parent. An obligatory monthly or weekly push notification from the communications department about a district event will not draw the parent in to interact with the App daily. A standalone district, school calendar that is not integrated and personalized to the parent is not relevant. A directory with contact information of administrative staff that parents rarely interact with is not useful to the parent. 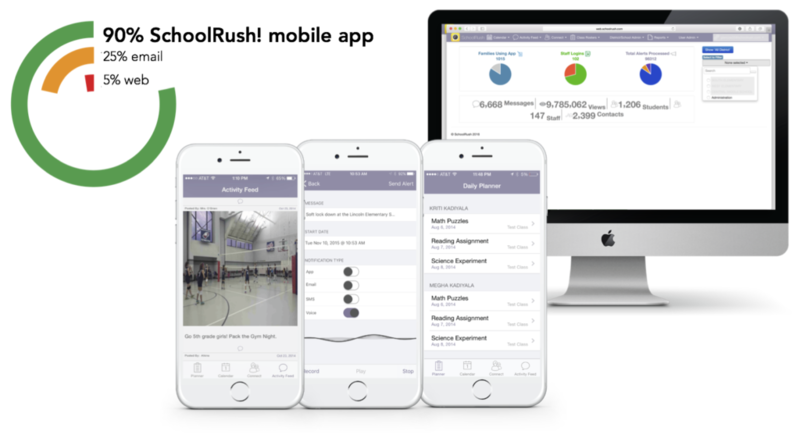 School districts that have deployed School Rush school communication App have experienced 90% (of) parents downloading the App and 90% of them check their school App at least once a day. School Rush! school App message feed gives parents info about just their kids in a social media style activity feed. Photos & notes on everything their children are learning in classroom projects, activities, along with district news. Dr. Wang, Glencoe Public Schools, says “We are pleased to offer SchoolRush as a communication tool across our schools. The possibilities to use the app to inform parents and celebrate student learning are endless!”. School Rush! school communications platform also tracks and makes available meaningful metrics in an easy to use dashboard so administrators can review how parents are engaging with the App. Why do Schools prefer School Rush! school communication App? Request your School Rush demo today.